“It is a beautiful thing to be able to transmit the landscape in our wines,” said our host as she sat at the head of the tasting table. A panoramic window framed the rolling hills of Rioja behind her. I scribbled the quote down. Though I had heard similar statements before, it was a nice reprieve from the technical explanations about the wines we had just tasted. It was also another way of expressing what is considered the worthiest achievement of winemaking today – making wines of place. That wine has the ability to capture and express landscape, weather and geology regularly fills me with wonder and is one of the most intriguing things about it. In many ways it is what we taste for. “Once it gets to you,” my host said, grabbing the air in front as though snatching a fairy from the air, “you’re in”. Meet Tom. A friend I travel with in Europe on occasion who is a real life flâneur. Tall, of able means, whip smart, and always keen for an adventure, he is one of the most joyously cynical people I know. Tom approaches everyone with a flopped bottom lip and a furrowed brow as if he is already insulted at what they are about to tell him. It’s not so much that Tom doesn’t believe anything but that he will challenge everything. “What are we doing here anyway, shouldn’t we be in Bordeaux?” he’d say as we turned up at various wineries on my Spanish wine itinerary. This makes him an excellent foil, especially when wine touring, as nothing goes unchallenged. And let’s face it, we wine people can nurture some rather dubious ideas. “How is that even possible?” he asked again, tossing his head to the side in disbelief. I could see his point. The concept of terroir does sound a bit magical. Especially as we had just walked through a cavernous modern winery, with slick architecture and a large barrel room. It hardly seemed the environment for nature’s shades and nuances to be expressed. To a wine cynic, it was a red flag to a bull. It’s the stuff they turn up for. So I went on between ‘pffs’ and ‘tutts’ to describe that magical and elusive thing we call terroir. I explained there is no real definition for it but that it is the combined affect of the natural features that a particular environment has on a grape. 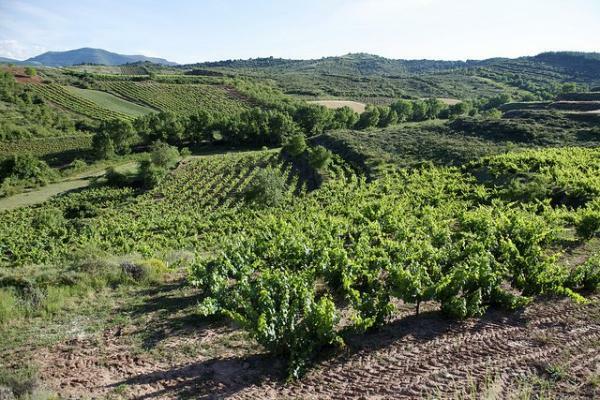 The terroir of a region is a combination of the way the slope faces and its exposure to the sun, the types of soils and their mineral components, the weather, the climate, and perhaps a suite of other things not yet detected by us that have an effect on a wine made from grapes from that area. Yes, and no. I explained how a glass of wine from one vineyard can taste different from one just a few yards away and that two wines from different vineyards but made by the same winemaker taste different because of the natural components of the land. Scientists don’t always agree that aspects such as minerals get into the vines for us to taste. Maybe it’s debatable why terroir exists, but the fact that wines when grown in the same areas consistently taste unique is accepted by most. Anyway, if we dismissed everything we couldn’t quite explain but felt to be true, the world would be a duller place. “Why bother? Why not just make the wine?” This was a harder one to answer. Many don’t make wines of place and some of the great wines of the world are blends of regions, of course, and those can still be great wines. But those that do will mention truthfulness of place, respecting the landscape, expressing that which is. Many winemakers know their land – their terroir – intimately and wish to share and honour that through their wine. Just as significant is the sheer pleasure of it. The ability of wine to capture and express landscape and transport the drinker to it is a thing of wonder. Imagine: you could be in a wine bar in Melbourne tasting the climates of Rioja, or in London tasting the dried herbs and earth of the Australian bush, or anywhere revelling in the chalk, flint and seashell notes of Chablis. It’s enough to make your world smaller, larger and more pleasant all at the same time. Previous post: Chapoutier 2015 Sélections Parcellaires: the best vintage since 1990?